Most college finals end up in a stack on a professor's desk. For one group of MIT students, however, their three-semester long project has a slightly different destination - outer space. The final in this case is an exoplanet-finding "CubeSat" - a small, rectangular satellite that's about as long as a skateboard and as heavy as a bowling ball. 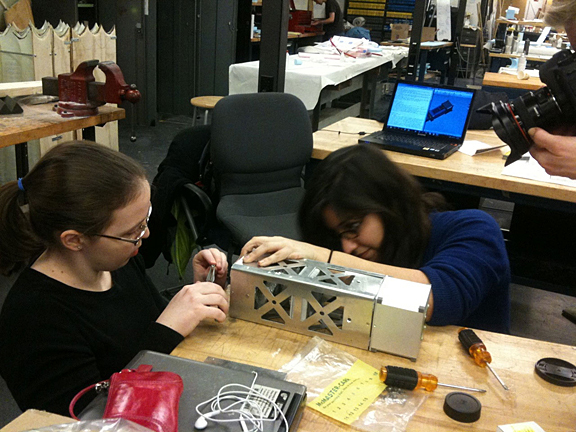 Over the course of three semesters, MIT students have developed parts of the mission from initial concepts to functioning hardware, aiming for launch in 2012. Because CubeSats are so small, they can piggyback on the rockets that take much larger satellites to space, giving educational institutions like MIT the chance to test new technology and perform experiments in space more easily and cheaply. "We had the idea of using a CubeSat to look for exoplanets a few years ago," said Sara Seager, the astronomer and expert in exoplanet atmospheres who teaches the class. "The beauty of the project is that it's a prototype--low risk and low cost means we can move quickly to get the satellite built and launched." 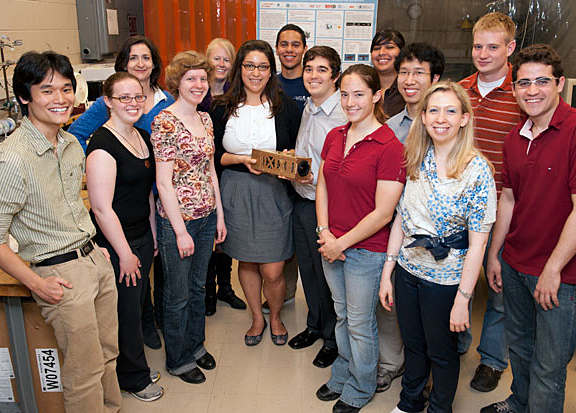 MIT Students pose with their exoplanet-finding CubeSat, scheduled to hitch a ride into space in 2012. Unlike the recent planet-finding focus to search for signs of exoplanets orbiting stars smaller and dimmer than the sun, the MIT prototype space telescope will focus on a single star like our own during its mission, looking for the telltale dimming of light that occurs when a planet passes in front of its star. This way of planet-finding is called the "transit" method, and though many exoplanets have been discovered this way, few have been found orbiting stars like our own. "Astronomers have found it hard to find exoplanets orbiting bright, sun-like stars because the brightness overwhelms their very sensitive detectors," said Rebecca Jensen-Clem, a fourth-year undergraduate. "If this prototype mission is successful, we could someday launch a whole constellation of small, planet-finding telescopes that could potentially find Earth-like planets orbiting stars close by." In addition to its potential scientific bounty, the CubeSat project went a long way toward helping prepare students for the challenges of someday working on a large-scale space mission. "There were a lot of lessons learned in time-management and communication, because the project moved on a pretty quick timeline, and because we had both science and engineering students," said Joseph McCarter, also a fourth-year undergraduate. "But knowing that what we were working on was a real mission that was going to space was a real motivating factor." Students were responsible for many aspects of the CubeSat, from power systems and optics to propulsion and communication. That motivation will turn into anticipation as the CubeSat project is finished up and the students wait for a confirmed launch date. Both Seager and Jensen-Clem are optimistic that this first prototype could yield significant future dividends. "Nature gives us so much to find - we just have to look," Seager said. Jensen-Clem sums it up in a different way: "Someday, I might be able to point to a star in the sky and tell people that there's a planet like ours out there. I'll be proud to have been a part of that search." The CubeSat project was partially supported by a Strategic University Research Partnership grant from NASA's Jet Propulsion Laboratory. 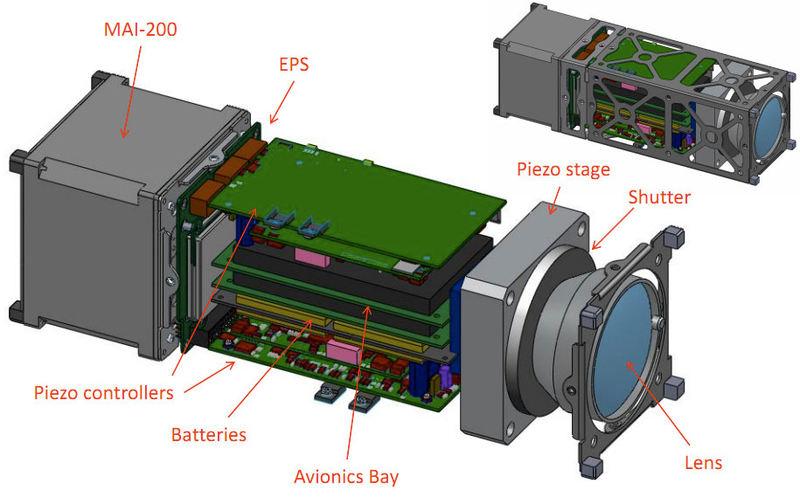 The ExoplanetSat CubeSat project is jointly run by MIT and Draper Labs.